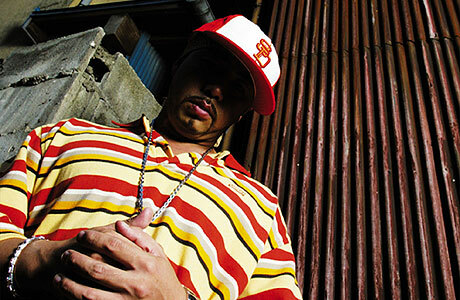 K Dub Shine is known as an MC who has helped transform the Japanese Hip Hop scene. His inspiration comes from some of the best that ever did it. He has the rhyme poetry of Rakim. His political messages provoke the audience like KRS ONE. His live performance rocks crowds as Run DMC did (R.I.P. Jam Master Jay). K Dub was born and raised in Shibuya Tokyo, one of the epicentre’s of Hip Hop in Japan. His interest in music was sparked at a young age via radio and clubs, and by the age of 15, he became fascinated with Hip Hop. Fortunately, he had a chance to move to the U.S. when he was a high school student. He headed to Philly first but ended up settling in Oakland, CA. He attended college there and began rapping with a local crew, and eventually he linked up with the Hieroglyphics crew and The Coop. While he was hanging out with those rappers, he formed a group with his home boys who were visiting and staying with him from Tokyo. They named their group King Ghidorah, after a famous monster with three heads from the Godzilla movies. While he was back in Tokyo to visit in 1994, Fab Five Freddy who was shooting the “Yo! MTV RAP” Japanese report featured King Ghidorah on the show. It was aired in the U.S. and helped create an awareness of the Japanese Hip Hop scene. In 1995, he put an end to an 8 year stay in the U.S. and headed back to his home town, Shibuya. King Ghidorah started having shows at local clubs and opened for various artists from the U.S. such as Ed OG, Lord Finess, and Big L (R.I.P.). It didn’t take much time for people to recognize their talent. They dropped their first album in 1996 on the indie label P-Vine records, and it sold 140,000 units. When they returned from the tour for the album, they decided to pursue solo careers, and after spending time in the lab, K Dub Shine dropped his first solo album in 1997, followed by his sophomore project in 2000. With his solo work, he became the most favorite featured artist for many R&B singers and fellow rappers . 2 years later, King Ghidorah re-formed to fullfill the fans huge expectations. The reunion album, “The Last Weapon” (Def Star/Sony) sold over 250,000 units, and blazed the charts with 2 singles in the top 10 simultaneously. His latest album as a solo artist was released in July 2004 and received outstanding reviews. In addition to his music K Dub Shine is very involved in social issues, and he hosts a tv show called “The Meeting Room” which addresses social issues in the community.Now, streets are vociferous and anxious to cop K Dub Shine’s new album as a solo artist. It would be the biggest bomb dropped on the Japanese hiphop scene this year.